Seminar featuring Dr. Levmore at Himmelfarb High School! Home » IYIM NEWS AND EVENTS » Seminar featuring Dr. Levmore at Himmelfarb High School! 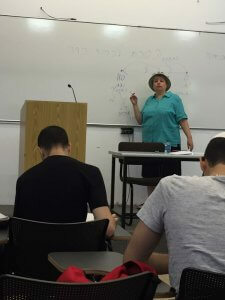 The entire tenth grade of the Himmelfarb High School for Boys heard a lecture from Dr. Rachel Levmore – director of the IYIM Agunah and Get-Refusal Prevention Project– within a framework of a seminar day about halakhic contracts. All 80 students paid rapt attention as Dr. Levmore gently explained the complexities of divorce in the Jewish-Democratic State leading to get-refusal. The Agreement for Mutual Respect was presented with the boys all appointed as emissaries for its dissemination among their friends and family. The lecture was very well received not only by the students, but by their rabbi-teachers as well! In fact, one highly respected rabbi reminded Dr. Levmore that he had invited her to speak almost twenty years ago before the students of the Yeshivat Hesder-Neveh Dekalim of Gush Katif!